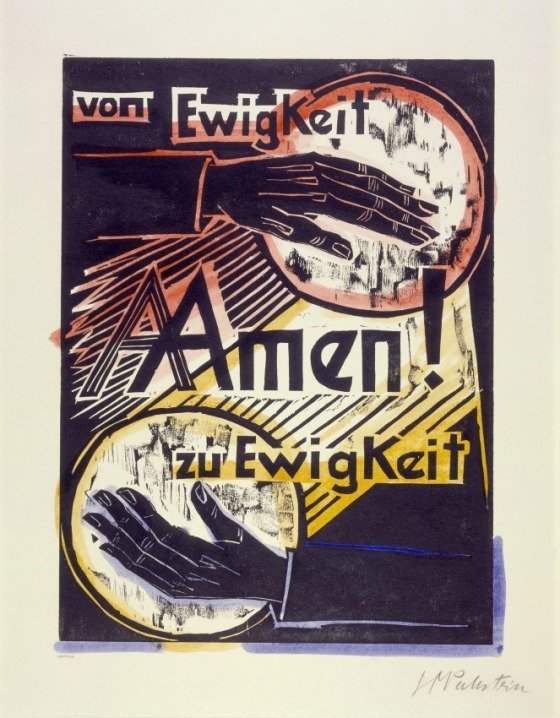 These are three prints from a series of 12 that illustrate the Lord's Prayer by the German artist Max Pechstein. These prints were done in 1921. Pechstein is considered a German Expressionist artist and was a member of Die Brucke (The Bridge) who were all young artists who were seeking to make art that was distinctly different from the more refined and academic painting of their predecessors. They were drawing inspiration from the more primitive arts of other cultures. Many of these artists had become discouraged trying to effect societal change with their art and political subject matter and had begun to turn to religious themes. Pechstein's Lord's Prayer prints show regular people from the fishing village where he was living at the time working out the lines of this central prayer that most everyone at that time would have known by heart. His striking designs and bold draftsmanship really bring this prayer to life. There is a show of prints from the Jansma Collection at the Grand Rapids Art Museum on view right now. I will be joining Anthony Mead from Dinderbeck artist collective on April 5 at 7PM to do a talk about these prints. Please come and join in our conversation that night. We would love to have you.